It is time for another edition of craft lightning. Carolina from 30 Minute Crafts and myself will be live crafting for 10 minutes. 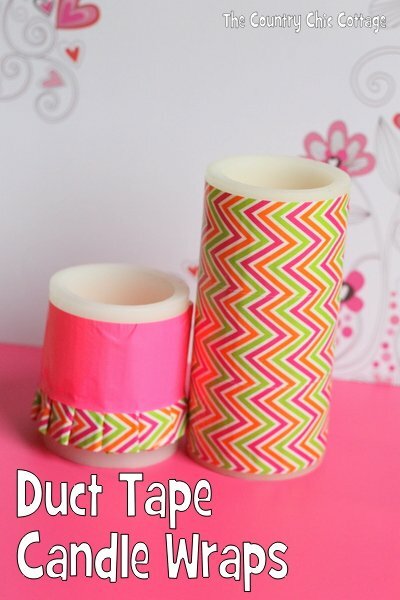 Tonight I will be showing you how to make my duct tape candle wraps. So simple yet so cute! These are perfect for Valentine’s Day or even just for spring! Watch the LIVE video below or if you miss it live you can watch it anytime. In case you missed it, here are a few written instructions. Layer three rows of duct tape onto parchment paper being sure to line up any pattern. Trim the parchment paper around all four edges so some of the tape shows. Use those exposed edges to adhere your wrap to your candle. Adhere one row of duct tape to some parchment paper. Start with a contrasting piece of duct tape approximately 4 times as long as your first piece. Fold over along the length leaving only 1/4″ to 1/2″ of the strip exposed. Use the exposed edge of your parchment paper covered piece to adhere the second piece in an accordion type fold. Continue accordion fold all the way down your parchment covered piece. Use remaining exposed adhesive to wrap your candle. 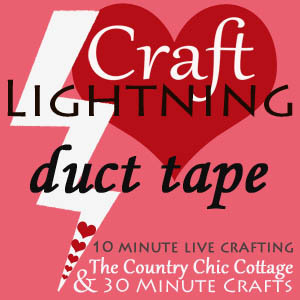 I hope you enjoyed this edition of Craft Lightning and my duct tape candle wraps. Stay tuned to Crafty Hangouts for even more LIVE video fun! We will be posting information for future events there. Edited to add: the book I mentioned in the video is Crazy Cool Duct Tape Projects by Maria Pawelko. Be sure to check it out! previous post: Where I am this week!